Full-color mapping pre-loaded onto your device designed for at-a-glance navigation (provides cues for upcoming turns). Incredibly easy-to-read/comprehend. Features a scratch-resistant Sapphire lens plus Wifi capabilities, which enables your watch to send data to Garmin Connect without syncing with your smartphone. The fenix 5X now comes with standard wrist-based heart rate monitoring featuring a sensor that is flush with the watch (to avoid rubbing on wrist). Offers 22 different premium leather, metal or silicone bands making it easier than ever to mix and match for any sports, activity or event plus the new QuickFit system allows you to simply 'pop' off the band and 'snap' on a new one! 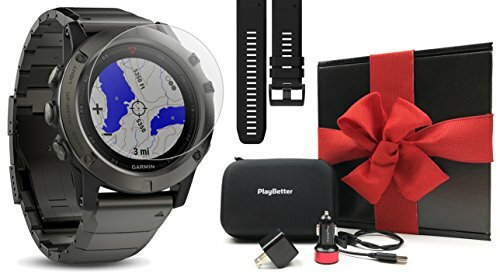 MEMORABLE GIFT - Keep your fenix 5X looking brand new with the Extra QuickFit Band, our Ultra-Clear Glass Screen Protector and PlayBetter Hard Carrying Case and while the Wall & Car USB Charging Adapters will ensure that you're never without a charge!